The Zodiac killer is one of the most elusive and unusual serial killers in American history. Known for his bizarre, rambling handwritten letters, the Zodiac sent baffling ciphers, quoted musical lyrics, taunted police and threatened to shoot school children. Unlike most serial killers, the Zodiac called police to report his crimes and wore a hooded costumer featuring his chosen symbol, the crossed circle. The Zodiac wounded two people and killed at least five others during the period between December 1968 and October 1969. More letters, postcards and other clues continued until 1971 when the Zodiac apparently disappeared. In January 1974, the San Francisco Chronicle received another letter which hinted at suicide and described the classic horror film The Exorcist as “the best saterical comidy.” Hoax letters continued over the years but the infamous Zodiac vanished into the history books and a legend was born. Decades later, the popular image of the Zodiac transformed into a criminal genius and expert marksman who claimed dozens of victims and escaped justice because law enforcement agencies refused to cooperate. This mythical Zodiac became the public version of the story and the remaining confusion surrounding unanswered questions fueled ongoing speculation. Books, televisions documentaries, movies and websites provided conflicting and unreliable accounts while promoting various theories and suspects. The facts were often lost as the unsolved mystery continued to fascinate and haunt the minds of curious crime buffs. The legend of the Zodiac killer is based on many popular myths, but the facts tell a very different story. MYTH # 10 – The Zodiac was an expert marksman. The Zodiac shot five victims in three different attacks. In the first shooting, the killer shot one victim in the head at point blank range. Another victim was shot five times in the back as she was trying to run away. In the second attack, the killer walked up to a parked car and opened fire on the victims sitting inside. In the third shooting, the killer shot the victim in the head at point blank range. These shootings did not demonstrate any particular skill with weapons beyond the ability to point the gun and pull the trigger. Graysmith told readers that victim Betty Lou Jensen was shot five times “in a tight pattern in the upper right portion of her back.” [Robert Graysmith, Zodiac (New York: St. Martin’s Press, 1986), Page 6] The autopsy report and photographs taken of the victim’s body at the morgue proved that the wounds actually began at the lower back and continued upward to her right shoulder in a pattern which was not tight but scattered across her back. During the shooting at Blue Rock Springs Park, the killer shot two victims in a parked car. Michael Mageau was closest to the gun but he survived despite being shot in the jaw. This shooting did not require any skill. Victims David Faraday and Paul Stine were both shot once in the head at point blank range in shootings which did not demonstrate or require any special skills with a weapon. The Zodiac may have had some military training with weapons and he may have been a skilled marksman, but the evidence does not indicate that the killer was an expert or that he had received any special training. In June 1970, a Zodiac letter included a code which was accompanied by a map of the Bay Area with a crossed circle drawn over the peak of Mt. Diablo. In another letter, the Zodiac wrote, “The Mt. 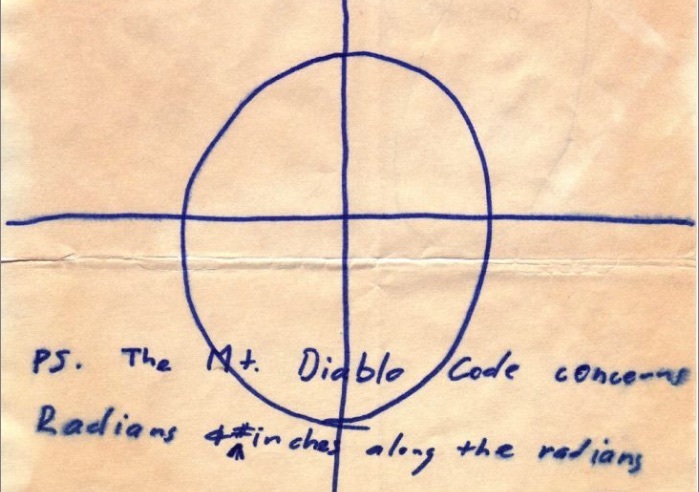 Diablo code concerns radians & # inches along the radians.” In 1980, amateur sleuth Gareth Penn claimed that the Zodiac crime scenes formed a giant “radian” angle on the surface of the earth. A radian is an angle valued between 57 and 58 degrees, or, 57.296, defined as “an angle subtended by an arc of a circle equal in length to the radius of a circle.” The radian is the usual unit of measurement in higher mathematics, however, in applications of mathematics to surveying and navigation, the degree is more commonly used. The term “radian” is a contraction of the words “radius-angle.” The Zodiac wrote that his code and map concerned “radians,” meaning more than one radian. In mathematics, radians are not always measured in full units; rather, radians can be measured in any numerical value. The Zodiac’s clues do not concern a radian, but more than one radian, as in “radians.” Penn’s single radian theory also fails to account for the Zodiac’s instructions regarding the Mt. Diablo map and code – radians and a number of inches along the radians. The Zodiac’s map illustrated the Bay area, including San Francisco, Berkeley, Oakland, and the southern portion of Vallejo. The border of this map falls just north of Lake Herman Road, which is clearly visible at the top. Blue Rock Springs Park, not visible on this map, would appear just above its northern border. The only other “Zodiac” crime scene visible on this map is the intersection of Washington & Cherry Streets in San Francisco, scene of the murder of cabdriver Paul Stine on October 11, 1969. If the Zodiac’s map, code and radians clues pertained to Blue Rock Springs Park, the Zodiac’s map would be of little assistance in deciphering his clues. A killer who wanted the map to assist someone in finding a location would most likely select a map which included that location. None of the Zodiac letters included the suggestion that authorities would find “something interesting” if they placed a radian on the peak of Mt. Diablo. Penn incorrectly stated that the shooting took place at the Blue Rock Springs golf course but the crime occurred across the street from the golf course at the parking lot of Blue Rock Springs Park. Penn incorrectly measured his radian when using the incorrect location of the golf course. The correct locations form an angle measured at approximately 60 degrees, far more than a radian. Penn’s locations, measurements and conclusions were incorrect, and the crime scenes did not form a radian, but his radian claim was repeated in popular books by crime author Colin Wilson and endorsed by many others [including this author, see: [Michael Butterfield, Gareth Penn & The Radian Theory (ZodiacKillerFacts.com, 2009) HYPERLINK “http://www.zodiackillerfacts.com/radian.htm”]. Other amateur sleuths later adapted the radian myth to suit their own theories. In his book Most Evil, retired Los Angeles police detective Steve Hodel used the radian theory to support his claim that his father was responsible for the Zodiac crimes, the Black Dahlia murder, the Chicago “Lipstick” killings, and many other unsolved crimes. Dennis Kaufman also used the radian myth to accuse his stepfather. Another amateur sleuth later claimed that Gareth Penn was responsible for the Zodiac crimes. According to Gareth Penn’s theory, the peak of Mt. Diablo, the crime scene in San Francisco and the crime scene in Vallejo all formed a radian angle between 57 and 58 degrees, but the correct measurement proves that the angle formed by these locations is at least 60 degrees. The Zodiac’s map and radian clues may concern a geometric construction using geographic locations on a map, but the facts debunk Gareth Penn’s radian theory. 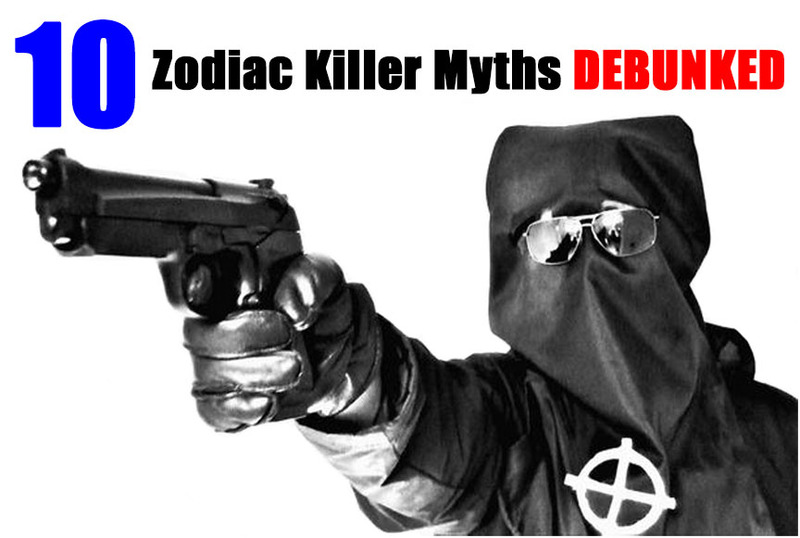 MYTH # 8 – The Zodiac crimes were done by copycat killers or were a hoax. Epstein’s theory worked backward from the pre-conceived notion that Arthur Leigh Allen must have been the Zodiac and then discarded and dismissed evidence which conflicted with his assumptions. Epstein’s certainty of Allen’s guilt appeared to be based on an eyewitness identification of the suspect. On the night of July 4, 1969, Michael Mageau and Darlene Ferrin were sitting in a car at Blue Rock Springs Park when a man appeared and flashed a bright light into their vehicle. Shots rang out and Michael and Darlene were both wounded. Mageau told police that he did not get a good look at the shooter and only caught a brief, profile-view glimpse as the man was walking away. Vallejo detective Ed Rust interviewed Mageau at the hospital three days after the shooting, and he did not believe that Mageau could identify the killer. More than two decades later, retired Vallejo police detective George Bawart met with surviving victim Michael Mageau at the Ontario airport on August 16, 1991. Bawart displayed a collection of photographs featuring several men, including Zodiac suspect Arthur Leigh Allen. 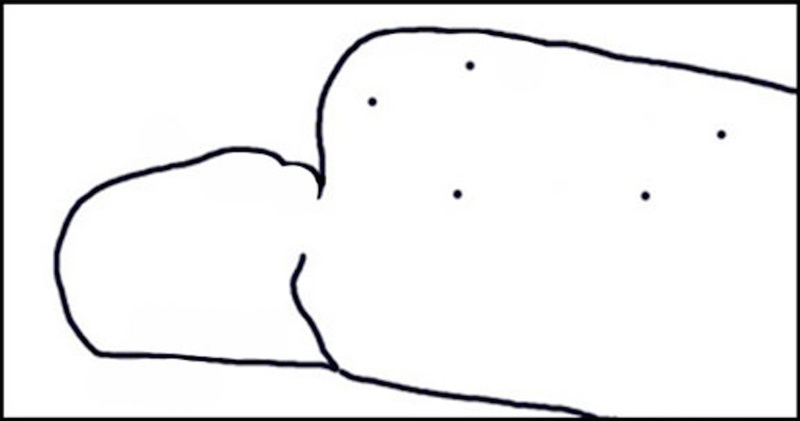 Mageau pointed to Allen’s picture and said, “That’s him. That’s the man who shot me.” When asked if he was sure, Mageau pointed to a photograph of another man and said, “He had a face like him.” Mageau essentially told Bawart that Allen committed the crime while wearing the face of someone else. Police did not believe that Mageau’s identification was reliable or accurate. In 1969, Mageau provided a description of the killer which did not match Allen or his appearance at that time. In a 2007 interview, Mageau said that he hoped the killer would someday be identified, although he had already identified Allen as the killer and Allen had died in 1992. The evidence did not indicate that Allen was responsible for the Zodiac crimes or the Zodiac letters. Handwriting experts concluded that Allen did not write the letters, a fingerprint believed to be the Zodiac’s did not match Allen, Allen did not match descriptions provided by eyewitnesses, Allen’s DNA did not match DNA found on the envelopes used by the Zodiac, and palm print found on a Zodiac letter did not match Allen. A police officer who reportedly saw the Zodiac near a crime scene stated that the man was not Allen. Epstein’s theory that the third and fourth Zodiac attacks were the work of copycats was not supported by evidence and relied on many implausible scenarios. The theory that the Zodiac letters were forged by a journalist or someone working in law enforcement ignored important facts about the crimes. Several handwriting experts had concluded that one person was responsible for the original Zodiac letters. 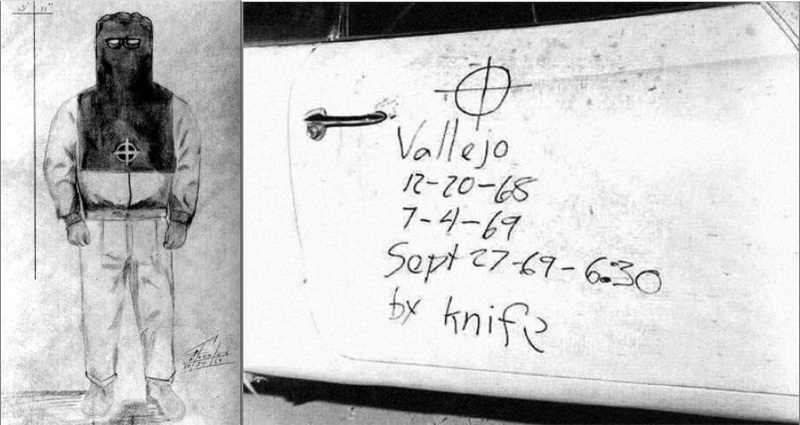 During the third Zodiac attack, the killer left a handwritten message on the victim’s car and a handwriting expert concluded that writer of the Zodiac letters was responsible for the car message. The boot prints of the killer led from the crime scene to the message on the car door. After the fourth Zodiac attack, the killer mailed a letter accompanied by a piece of the victim’s bloodstained shirt. Handwriting experts concluded that the letter was written by the author of the Zodiac letters. The handwriting was directly linked to the killer, and Epstein failed to present any credible evidence implicating any journalist or investigator in the forgery of Zodiac letters. The facts indicated that the most logical and plausible explanation was that one man was responsible for the crimes and the letters. Other scenarios required many coincidences, conspiracies, and copycat killers. Charles Manson and his “family” of killers became famous after a brutal series of murders in Southern California. Some of the family members had left messages written in blood at the crime scenes. Charles Manson and other family members spent time in the San Francisco Bay Area, leading some to speculate that Manson and the family were somehow connected to the Zodiac murders. The alleged Zodiac/Manson suspect Bruce Davis was convicted for the murders of music teacher Gary Hinman and ranch hand Shorty Shea. Howard Davis claimed that those behind the cover-up feared that another trial would somehow jeopardize the previous convictions. A Zodiac prosecution would not somehow undo Bruce Davis’s previous murder convictions. 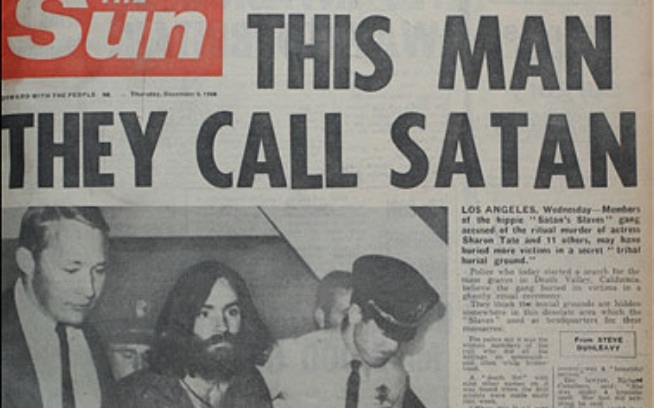 The so-called “Zodiac/Manson connection” remains a popular myth and a common theory on many websites, but the available evidence does not indicate that Charles Manson and his followers were involved in the Zodiac crimes. MYTH # 6 – The Zodiac killed dozens of victims. In his letters and in telephone calls to police, the Zodiac claimed credit for six specific crimes and mentioned one other attack but did not identify the victim. During the phone call to the Vallejo Police Department after the shooting at Blue Rock Springs Park, the caller claimed that he was responsible for that attack and also said that he had killed some kids “last year,” an apparent reference to the murders on Lake Herman Road. In his first two letters, the Zodiac described the shootings on Lake Herman Road and at Blue Rock Springs Park. At the scene of the stabbings at Lake Berryessa, the attacker left a handwritten message on the door of a victim’s car which included the dates of the two shootings with the date of the knife attack. In the letter sent after the murder of cab driver Paul Stine, the Zodiac claimed that he had killed Stine and the “people in the North bay area,” an apparent reference to the previous attacks. After media reports linked him to the unsolved murder of Riverside City College student Cheri Jo Bates, the Zodiac wrote, “I do have to give them credit for stumbling across my Riverside activity but they are only finding the easy ones there are a hell of a lot more of them down there.” After media reports linked him to the failed abduction of a pregnant woman and her ten month old daughter, the Zodiac sent another letter about a “rather interesting ride” with a woman and her baby. Another Zodiac letter asked that Bay Area residents wear “Zodiac” buttons. In a subsequent letter, the Zodiac stated he was angered when citizens did not comply with his demand. He wrote that he had punished the people by shooting a man sitting in a parked car. A report prepared by the California Department of Justice included a list of possible Zodiac victims. Robert Graysmith’s book Zodiac included a list of possible Zodiac victims and the book cover stated that the killer was possibly responsible for fifty murders. 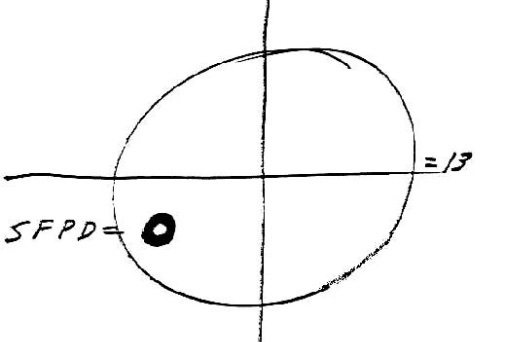 Speculation about the actual number of Zodiac victims was complicated by the Zodiac’s habit of including a “box score” at the end of some letters which featured the killer’s crossed-circle symbol and a number followed by “SFPD = O.” One of the last Zodiac letters featured a box score of thirty-seven, leading to the assumption that the killer had claimed thirty-seven victims. The true meaning of the box score remains unknown. Amateur sleuths, reporters, crime buffs and others have tried to link the Zodiac to other crimes. Sonoma County Sgt. “Butch” Carlstedt made headlines with his theory that the Zodiac was responsible for many murders across the country and the locations of the crime scenes formed a giant “Z” on a map of the United States. Despite the many theories and the Zodiac’s vague references to possible unidentified victims, the available evidence does not connect the killer to crimes other than the original six cases traditionally attributed to the Zodiac. MYTH # 5 – The Zodiac took credit for crimes he did not commit. The Zodiac’s habit of including a “box score” at the end of some Zodiac letters was understandably interpreted by many observers as a victim count. Media reports repeatedly linked the Zodiac to many unsolved crimes despite the fact that the evidence did not establish any connection. The Zodiac did not deny or confirm his involvement in any other crimes despite ongoing news reports suggesting that he was responsible. 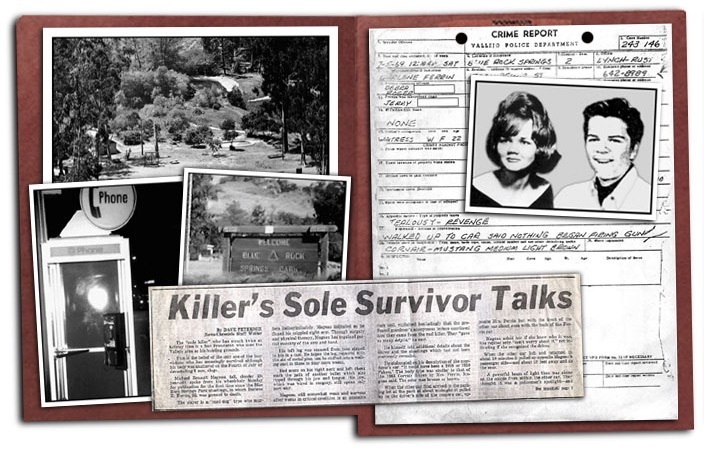 The evidence demonstrates that the Zodiac only took credit for six specific crimes: the murders on Lake Herman Road, the shootings at Blue Rock Springs Park, the stabbings at Lake Berryessa, the murder of a cab driver in San Francisco, the murder of Cheri Jo Bates in Riverside, and the failed abduction of Kathleen Johns in March 1970. The evidence indicates that the Zodiac remains the most logical suspect in all six crimes. While the killer did allude to other crimes, the available evidence does not connect the Zodiac to any other attacks. All of the suspected Zodiac crimes remain unsolved, and the identity of the real killer remains unknown. The evidence indicates that the Zodiac remains the most logical suspect in these cases. MYTH # 4 – Police were about to arrest a major suspect but he died. At the time of Allen’s death, the Vallejo Police Department had not produced any credible evidence to implicate Allen in the Zodiac crimes. Allen’s estranged friend claimed that Allen had once confessed his desire to commit crimes, write letters and call himself “Zodiac.” This informant later embellished and invented more stories about Allen, and even retired Vallejo detective George Bawart concluded that the friend was not a credible witness. [George Bawart, This Is The Zodiac Speaking, documentary (Paramount, 2007).] Handwriting experts had also concluded that Allen did not write the Zodiac letters, including the letters which claimed credit for the murder of Darlene Ferrin at Blue Rock Springs Park in Vallejo. The only alleged link between this crime and Arthur Leigh Allen was an unreliable eyewitness identification from surviving victim Michael Mageau. This evidence did not justify filing criminal charges against Allen for the Ferrin murder. Responsible prosecutors would not pursue charges against Allen based on the available evidence, and any reasonably competent defense attorney could win an acquittal in a court of law. MYTH # 3 – The Zodiac called a TV show with attorney Melvin Belli. In his book Zodiac Unmasked, author Robert Graysmith told readers that the Zodiac called the home of attorney Melvin Belli and declared, “Today’s my birthday.” According to Graysmith, this call occurred on December 18, the birthdate of his suspect Arthur Leigh Allen. [Robert Graysmith, Zodiac Umasked (New York: Berkeley, 2002) Pages 365-366.] The film adaptation of Graysmith’s books included a scene which showed investigators sharing this information with Graysmith. Another scene is a reenactment of a television broadcast featuring Belli and host Jim Dunbar talking with a caller who claimed to be the Zodiac. On October 22, 1969, someone placed a telephone call to the Oakland Police Department and claimed to be the Zodiac. The caller demanded that attorneys Melvin Belli or F. Lee Bailey appear on the Bay Area talk show hosted by Jim Dunbar. Belli lived in San Francisco near the television station, so Belli appeared for the broadcast. A man called into the show and used the name “Sam” during the subsequent conversation. Belli also spoke with the man off the air, but police were unable to trace Sam’s calls and the identity of the caller remained unknown. After the broadcast, police played recordings of Sam’s voice for the three people who had spoken to the Zodiac. Surviving victim Bryan Hartnell and police dispatchers David Slaight and Nancy Slover all agreed that Sam was not the Zodiac. Weeks later, a Zodiac letter arrived at Belli’s home accompanied by a piece of a victim’s blood stained shirt. After the resulting publicity, “Sam” began calling Belli’s home. Police set up a trace and eventually discovered that the calls originated from a mental hospital. An FBI report dated February 14, 1970 stated that telephone calls to Belli’s home had been traced to a patient at the hospital, and authorities concluded that he was not the Zodiac. 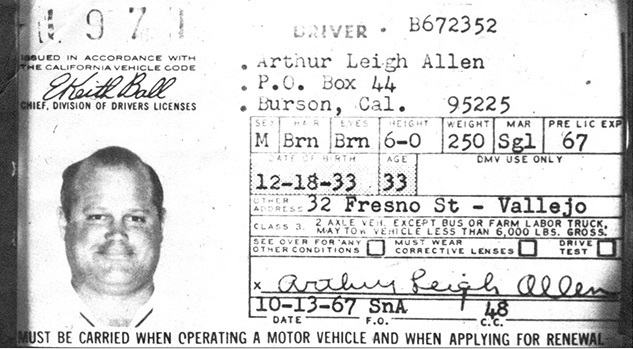 In the film Zodiac, Robert Graysmith cites the December 18th “birthday” call to Belli’s home and shows a copy of Arthur Leigh Allen’s driver’s license to SFPD Inspector David Toschi. The fictional Toschi seemed impressed by this evidence, but the real-life Toschi knew that the person who called Belli’s home was not the Zodiac. The FBI report indicated that the telephone call to Belli’s home had occurred in February 1970 and not on December 18, 1969, as Graysmith claimed. [FBI report # 9-49911-88, dated February 14, 1970.] The facts indicated that one individual placed the calls to the Dunbar show, but the movie Zodiac suggests that two people made the calls. The official documents demonstrate that police did not believe that the individual who called Belli’s home was the Zodiac. The FBI files demonstrate that the individual who called Belli’s home was identified and that person was not Graysmith’s suspect, Arthur Leigh Allen. MYTH # 2 – The Zodiac investigators did not cooperate. 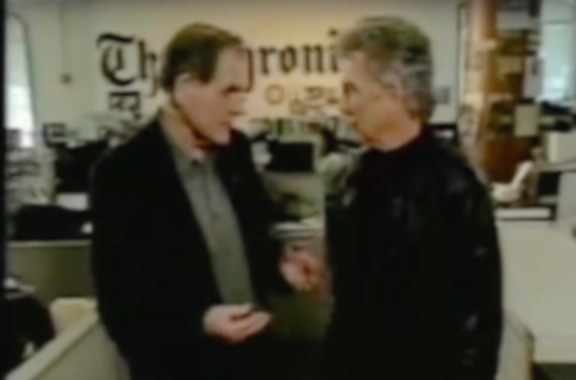 During a 2007 appearance on the television crime series America’s Most Wanted, author Robert Graysmith told host John Walsh, “I really wanted this guy caught, John. He was giving us so much information, the clues were so tantalizing. I realized that the police departments in the different counties were not sharing.” [America’s Most Wanted, Zodiac (Fox Television, 2007).] Graysmith and other amateur sleuths often claimed that jurisdictional conflicts somehow hindered the investigation and permitted the killer to escape justice. All of the available evidence indicated that the various law enforcement agencies drawn into the hunt for the Zodiac cooperated and shared information. The overwhelming majority of those involved in the actual investigations have said that virtually everyone cooperated and shared information on a regular basis. A few individuals claimed that others had failed to share important information but they did not provide any specific examples and did not explain how these specific failures had ever hindered the investigation. MYTH # 1 – The Zodiac knew and stalked his victims. On the night of July 4, 1969, Darlene Ferrin and her friend Michael Mageau were sitting in a car at the parking lot of Blue Rock Springs Park in Vallejo, California. Another vehicle arrived and a man shined a bright light into Darlene’s car. Michael and Darlene speculated that the man was a police officer until he opened fire with a gun. Michael and Darlene were shot several times before the man finally left the scene. Michael survived but Darlene was dead on a arrival at a Vallejo hospital. Police investigated the possibility that Darlene was killed by someone she knew, including her ex-husband and others. Investigators searched for any information which indicated that anyone had any reason to kill Darlene, and her family, friends, co-workers and others were asked if anyone had been bothering or threatening her. Some people noted that one man named George had been harassing Darlene at her place of work. Police investigated and the man’s wife claimed she was with George at the time of the shooting at Blue Rock Springs Park. No other potential stalkers were identified during the investigation. Months after the murder, some members of Darlene’s family met with celebrity psychic Joseph DeLouise. Darlene’s mother told Delouise that Darlene had made a cryptic remark just hours before she died, “You might read about me in the papers tomorrow.” Darlene’s mother had not mentioned this potentially important information during any of her conversations with police. Later, Darlene’s sisters would claim that she had been part of a satanic cult, had known other Zodiac victims, and had been stalked by a man who committed a previous murder. The sisters never mentioned this seemingly important information to investigators searching for Darlene’s killer. Over the years, more stories circulated that the killer had known Darlene and attended a party in her home. [Chronicle staff, “One Killing Zodiac May Have Planned Carefully” (San Francisco: San Francisco Chronicle, May 4, 1981).] These stories were later repeated as fact in Robert Graysmith’s 1986 book Zodiac. Darlene’s sister Pam appeared in numerous interviews on television shows such as The Sally Jessy Raphael Show and Geraldo Rivera’s tabloid TV series Now It Can Be Told. She claimed that Darlene had known another Zodiac victim, was part of a satanic cult, witnessed a murder and was killed to prevent her from identifying the killer. Pam also claimed that someone broke into her home, knocked her unconscious, and stole important evidence which supported her various claims. Surviving victim Michael Mageau told police that he and Darlene were sitting in the car when the killer walked up and opened fire without warning. Michael said that the man did not speak before, during or after the shooting. In his book, Graysmith wrote that Pam claimed that Mageau later said that the killer had chased he and Darlene to the crime scene and then called out Darlene’s nickname, “Dee,” just before the shooting started. [Robert Graysmith, Zodiac (New York: St. Martin’s Press, 1986), Page 39.] Michael Mageau and Pam never shared this information with investigators. The sensational stories about Darlene Ferrin became popular myths repeated by many amateur sleuths. New theories claimed connections between Darlene and various suspects, adding to the confusion surrounding the actual circumstances of her murder. During many media interviews, Graysmith claimed that Allen had known and stalked all of the Zodiac victims. 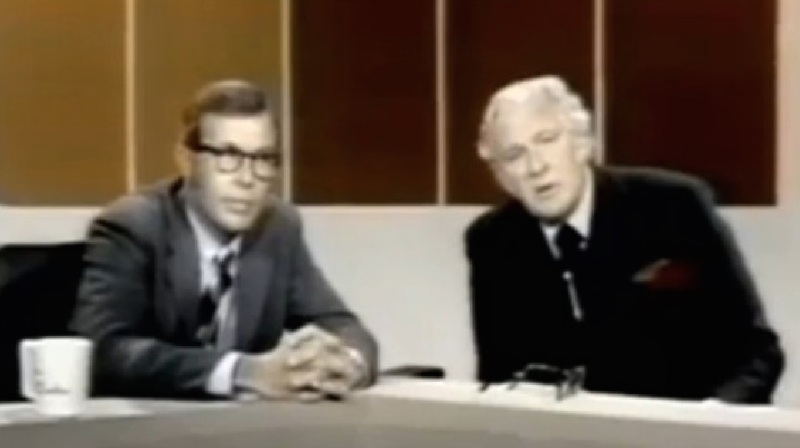 [Robert Graysmith, Ashley Banfield: On Location Television show (MSNBC. 2002).] Graysmith’s books did not contain any evidence to support these claims. Allen’s estranged friend Don Cheney read Graysmith’s books and then began telling a new story about Allen and Zodiac victim Darlene Ferrin. According to Cheney, he and Allen went to the restaurant where Darlene worked. Allen pointed to Darlene and expressed interest in her. Cheney told many new stories and claimed that Allen had taken him to a Zodiac crime scene, bragged that he was hired to kill Darlene, and discussed his plans to abduct young women. By 2007, Cheney’s ever-changing tales caused many of his original supporters to question his credibility. Retired Vallejo police detective George Bawart said that he no longer believed Cheney was a credible witness. The available evidence indicated that Allen did not know any of the victims. The original investigation of the Zodiac crimes included efforts to discover any link between the victims and the killer. The evidence indicate that the killer did not know his victims and that he selected them at random. More than four decades after the killer’s last known murder, the Zodiac continues to haunt the public imagination. Like many other infamous crime stories, the Zodiac mystery is retold and recreated by different narrators with different viewpoints and agendas. The fact-based portrait of the real-life Zodiac is overshadowed by a modern American myth. MICHAEL BUTTERFIELD is a writer who has conducted over a decade of extensive research on the Zodiac case. As a recognized leading expert on the unsolved crimes, he has served as a media source and consultant for news articles, television documentaries, and director David Fincher’s major motion picture Zodiac. Michael Butterfield appears in the Zodiac documentary Case Reopened, the History Channel series MysteryQuest, and the E!-Canada series The Shocking Truth. He is also a contributing author for True Crime: Case Files, True Crime Magazine, and the two volume collection of essays titled A History of Evil in Pop Culture.